Black cloak mercenaries concept art tutorial. 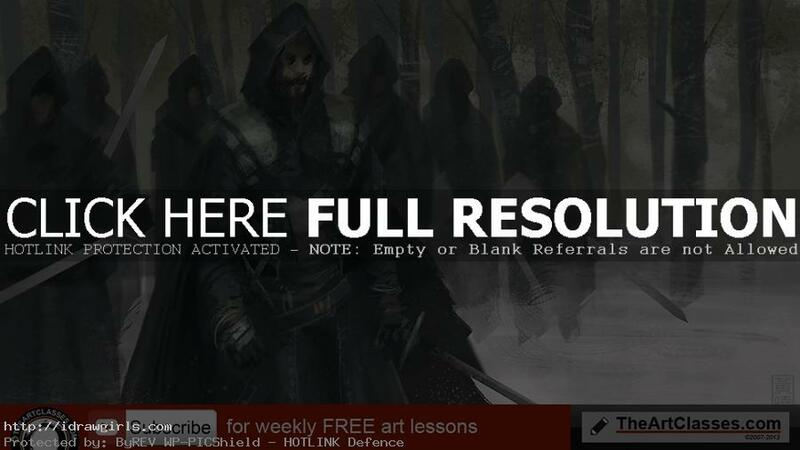 This tutorial shows you create a quick painting of Black cloak mercenaries concept art. In this tutorial, I start with a rough idea of a company of hired soldiers wearing black. The location is a rough idea of a forest covered with light snow somewhere in the far north. I have a very clear direction in my head on this piece. So not much changes from start to finished. You can scroll down further to see step by step images with instruction. First, I use default flat brush to create the background. Then I add vertical lines fort tree trunks. You have to make sure those vertical lines have interesting silhouettes. Then I paint a silhouette of a cloaked figure in the mid-ground. I then duplicate the figure into many figures with different sizes. I pick one of the figures as my focal point. t this stage, I only focus on big shapes, lightning and base to get the overall look and feel of the scene first. If I am happy with the overall look and feel. I begin to add more detail to the main figure. Then add some snow dust to create depth of field. After all the elements and composition is set with good lighting then we can start adding more detail to the rest of the image. On the figures. Then I use texture brushes to convey texture on their cloaks and armors. Then I add some textures to snow in the foreground and tree trunks in the back. Then I use lasso tool to create swords and shields. Once all the elements and composition is set with good lighting then we can take it to the final stage. Below is a step by step image. I use a lot of normal layers and just paint like I would paint traditionally in this video. But with a lot of help from custom brushes. Hopefully, this can be really helpful to you all. Tips on speed painting. Keep it simple first and make your image clear and easy to identify.